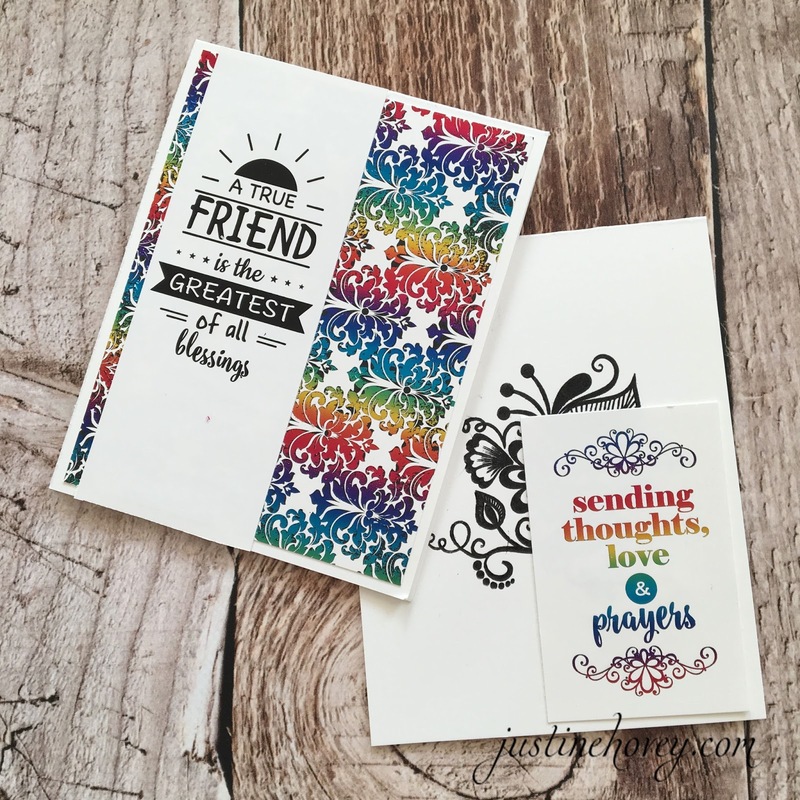 Justine's Cardmaking: Creativation Favourite! Gina K Foil Mates! Creativation Favourite! Gina K Foil Mates! today I'm super excited because I was able to finally get my hands on something that really impressed me at Creativation in Phoenix! As stated in my video, I've avoided the foiling technique because I thought I needed expensive machines and a laser printer, I was so excited to see this technique come to life with affordable supplies! I'm also giving away some of the designs you see in the video in case you want to try the technique as well! Thank you so much to everyone who has been following my April 1 Million Views Event! We are halfway through and videos will resume Monday. I love the rainbow foil. Your cards look beautiful as always. I'm a teacher to and have access to a laminator so I'm gonna have to try this out. Yes I love to foil in fact for Valentines Day my grandsons helped me make some cards!! We had fun!! Love the new Gina Kay line!! Wow!! What beautiful cards and so easy!! Thanks so much for sharing! I have never use foil . But not me I will give a try . Just have to buy a laminator .Thank u for sharing . This really added a lot of pizzazz! This is beautiful!! Yes, I have used it with adhesive tape. Good to know that the foil works with regular laminator. Thanks! Yes I have done foiling and I love the glimmer and shine of it. I also have a laser printer from our business and it is awesome. I love your cards and the foilmates are going to be wonderful to get. I have done a little foiling and I love the look of it. I really should do it more often, and these new things would make it much easier! Very pretty! I have done a little foiling but would love to try these. I love this Justine, your card turned out to be gorgeous!!! I have foiled before but I find it hard to get pre made designs to do! I did buy the Minc but I never use it because I don't have the right kind of printer and there isn't anywhere to buy the Heidi ones anymore in Ontario so I just don't use it. I wish I'd known I could just use a laminator! I am going to defiantly check out Gina K's Web store for these, I love the pattern piece that you used. Thank you for the awesome video and all the information!!! Beautiful cards. I have never tried foiling before. I saw Gina K come out with these and I have been wanting to try it, they make beautiful cards. Thank you for the chance to win. You're very generous. I love all the different designs of Gina's Foilmates. I have tried a little bit of foiling but haven't had a lot of success. I think I need a new laminator. Beautiful image that you foiled, and I love the multi-color foil! I enjoyed your video. I have tried foiling with Gina's foil mate sheets. Here sheets are great, but my laminator was not great. I may have to try again with a different laminator. I have tried foiling. At my sil's it was so much fun!! You card turned out beautiful!! Beautiful card. Love the foiling possibilities and those sheets from Gina K are awesome. Thanks for sharing and inspiring. I have not. Like you, I am a teacher and have a laminator though, so I will be trying it! These are so pretty! I love the look that foiling adds to a card! I have tried foiling many years ago, but now I think the supplies are much better. I need to give it another shot! Yes, I love foiling and I totally love anything Gina K!!!! Pretty card. I like the look of Gina K's Foil Mates and think this is something I would like to try. You can also foil over heat embossed images and sentiments... no toner needed! But, Deco Foil sells full sheets of toner paper that you can die cut and foil, so that gives you another option. Their sheets come in two styles, adhesive backed and plain. I find the plain to work slightly better but the adhesive back are convenient for intricate dies. Nuvo chisel tipped glue pens also work when applied to stamps and then stamped on paper and allowed to set to tacky before foiling. You can also use it through a stencil. It cleans easily if you wash it immediately. No need to spend a ton on laser printers or minc machines! So many options!!! What a great idea! Love Gina K paper products! So pretty, I agree with costs of all the items! It's crazy!! These cards are so pretty!! Your card is awesome. I have never tried foiling, but now I will probably try it. The expense was always my big concern. I've been waiting for these to be released! So excited! The only foiling I have tried before was a complete failure. I got one of the toner pens, but the pen dried out almost instantly. I have since read that happens to a lot of people and there is a way to make it work, but I don't remember where I saw that or how to do so. Ha! Many of us have the best of intentions for changing to a healthier lifestyle, but struggle to make the changes we would like. Unlock Your Hip Flexors Understanding some of the powerful forces behind how our behaviours are shaped can help us to plan lifestyle changes that we really will be able to stick to. Ok, so you want to learn guitar shops in chennai how to play the guitar, or you want your kids to learn how to play. The problem is you don't own a guitar, so you will need to buy one. The following will tell you what to look for in a good quality guitar without breaking the bank.So how do you buy a guitar? Well there's a right way and a wrong way. The wrong way is to just buy the first guitar you see when you're inexperienced and don't know what to look for. Lets say you're buying a guitar for your 5 year old son because you want him to become a rock star; Right? Good luck with that! If you go and buy harmonica shop in chennai a 5 year old kid a full-sized guitar it would be the same as giving him a String Bass or an Upright Bass that stands about 6' high. In other words, he /she would need a chair in order to play it. Even a full-sized guitar would dwarf him, as he is still developing. A better choice would be a concert size or ½ size guitar these small guitars are specially made for kids in the 3-6 year old range. For the 6-10 year olds, a ¾ size guitar would be appropriate. Above 10 years of age, go with the full size guitar. These are just some guidelines. There are a lot of other factors to consider. I love foiling. Such huge results with relatively little time or effort. I need to check out Gina K's designs. Thanks for sharing another beautiful card & video. Very pretty! I have access to a laminator at work. I'm going to give it a try with some pre-printed paper I've had since Christmas! If you are someone who's currently managing a business, you should understand the importance of marketing for the success of your business. With proper understanding of marketing strategies, you will not only be able to attract customers but you will also be able to gain a competitive advantage over your business rivals. The next day he receives a reply from the company informing him that his application was successful and first cheque to be deposited is already on his way.Two days later he receives a cheque for $1500. He deposits the money into his bank account and waits for the cheque to clear. He keeps $150 for himself, withdraws $1350 and sends it to the headquarters of the company somewhere in Russia through Western Union Money Transfer, exactly like they told him to do. Victor can't wait for the next cheque to arrive. Another cheque arrives a week later, this time a whopping $20000. Victor follows the same routine earning him another $2000. A third cheque arrives for $2388.89. But Mr. Scammer has earned the trust of Victor by now and Victor does not wait for the funds to clear before withdrawing the 90% for the company. What a lovely card and simple technique with lots of wow factor! Thank you for the inspiration. I bought a laminator but have yet to use it because of the toner issue. I guess you and Gina K have removed my obstacles! Beautiful foiled card. I have never tried foiling before but your tips and suggestions are very helpful. I have not tried foiling as I do not have a laminator or laser printer. These cards look amazing! I may have to find someone with a laminator. absolutely gorgeous! I love your videos! I have tried foiling before and liked it, I can't remember how I accomplished it. I will need to go back and see as it has been a very long time. I did buy some toner covered 8 1/2 x 11 sheets recently and I have foil and a lamina-tor. It will be fun to try the Gina K product as well. I've been nervous to try foiling as well. Your post has inspired me to give it a try as well. Thank you so much for this video! I also thought foiling would be a hassle- special machine, etc. But I own a laminator so will be foiling soon! Hooray- more uses for the laminator! Yes, I have done foiling before and don't think I will ever stop foiling! I ❤️ it! TFS! I have tried foiling and find the result beautiful. Can't wait to get some of these. I am intrigued by the foiling technique , have foil but no laminator yet, so have been waiting to try. I'm so excited about Gina K's new products - foiling is next on my list of things to do. Beautiful card and I love the foil and the gorgeous shimmer. I have tried foiling but need to do it more! I have a Minc machine and have done a couple of cute projects. Ths colors are so vivrant! So pretty, I need to try this! Thanks for sharing! I didn't even notice they were butterflies! I thought it was just a pattern. I love that rainbow stripe foil. So pretty. I'm going tho try that. I love these Gina K backgrounds! I love the multi-color foil, as well. This is so great! I would love to get my hands on some of these backgrounds! I have tried foil but I should use it more often! Love foiling! Soo pretty, thank you for the video! I was really WOW'd with your video and your cards.. they are absolutely gorgeous! Can't wait to try this technique!! Oh my!!! 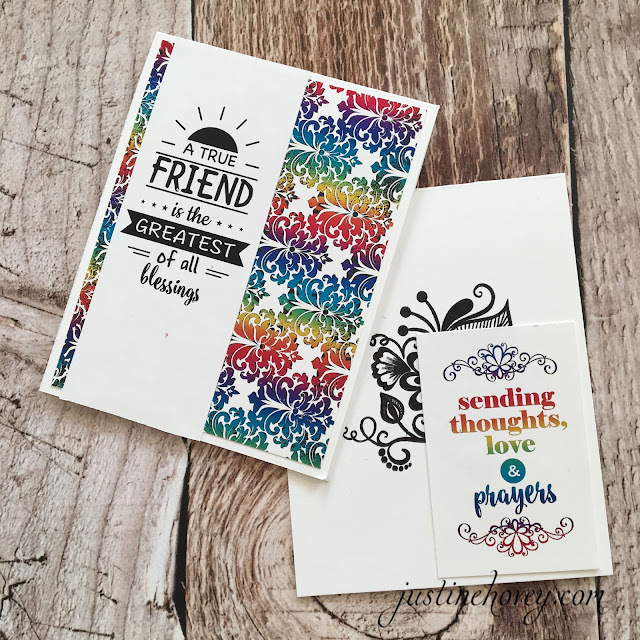 I'm in love for the rainbow foil and the amazing effect on your stunning cards!!! I've never tried it before but it's one of the most beautiful techniques that I've never seen!!! Stunning. I have not done any foiling yet. Hope to soon. I have never tried foiling but would love to try it! Absolutely stunning Justine. I have foiled before and its beautiful, I just have to get my daughter to print my images on her printer as I have an ink jet! I love the foil! I'm off to check out Gina K's stuff. Those sentiments are wonderful. I love that GinaK has pre-printed designs to use! I love foiling and bought a laminator for the same reasons - cheaper than a Mink machine. Thank you so much for sharing! This is so cool! I didn't know Gina K had this product! I have a mini Minc that I won and have barely used (probably because I don't quite understand how to use it properly and haven't really sat down to take time to do so yet). Thanks for your detailed video and the tip to use parchment paper! Love this cool technique! I have not done any foiling as I also thought I needed a Minc machine. Thanks for the great tips. I will be looking for this product. This looks lovely, never tried foiling before. Very pretty ! These foil mates sheets are amazing ! Today there are so many sites being put up each and every day - hell each and every minute. How are the people out there searching for your company going to find your website? Your website is ranking, but it is slowing losing ground on search engines results. You are starting to see less and less visitors to your site. So what can you do to combat this trend and take back over the search results? I haven't tried yet but I think the effect is beautiful! Foiliscious! I have foiling on my to-do list, but have yet to foil anything... hope to soon. The foiling looks so wonderful! I haven't tried it yet because I thought it was too complicated, too, but you sure describe it as simple! African Mango is the new weight loss craze. This article separates fact from fiction, and helps you work out which retailers are genuine. Plus, helpful tips on how to get your money back if you have been scammed. Beautiful cards! I have tried foiling before and I absolutely love it! I have some foil but wasn't sure how or what to use it on. I may have to give this a try. I love how many different ideas and things your are teaching all of us! Love the look of foiling, so pretty, bit I've never tried it. I don't have a lot of supplies, pretty much just you're basics. no foil though. I would love to try it though. I love foiling, and really like Gina K's new line of foils with Deco Foil. Thanks for sharing! I've never done foiling, but you made it look easy!! Might have to ask for supplies for Mother's Day! Stunning card! So elegant! Love the look of foil and this rainbow foil is extra cool! I love how you used the foiling. It is one of my favorite techniques. I have not tried foiling but I want to. I have foiled, but have only ever used gold foil! These colors are awesome! These are so pretty! Yes, I have tried foiling before but I am excited to try Gina's Foil Mates line. Thanks for the chance to win! I thought foiling required the expensive Minc machine but now that I know I can do it with a laminator I could actually afford to do foil mates. I just love Gina K. I wish I could buy all of her supplies and stamps. She is awesome. Love the foil! Im a bit foil obsessed these days and these foil mates are gorgeous! Never done foiling (not enough supplies) but really like Gina K's new line of foils. Thanks for sharing this card! wow, this is beautiful. I haven't tried foiling before, but I've been wanting to. I have never tried foiling before, but your card has is inspired me to give it a try. Mental manifestation is the name given to the first form of manifestation which happens in your life, in the form of ideas, thoughts, intuition, creativity, insight, plans etc. The mental manifestation is the precursor to physical manifestation, and changes in your state of consciousness will change the mental manifestations which occur, to therefore either propel or repel you from your goals. This article gives a brief introduction into mental manifestation, and how you can accelerate it, to therefore manifest the life of your dreams. You are diligent and consistent with your content and you stick to your posting schedule. Of course, it also goes without saying that your content is top-quality as well. However, you still need to determine if your content is having a positive effect on your business.